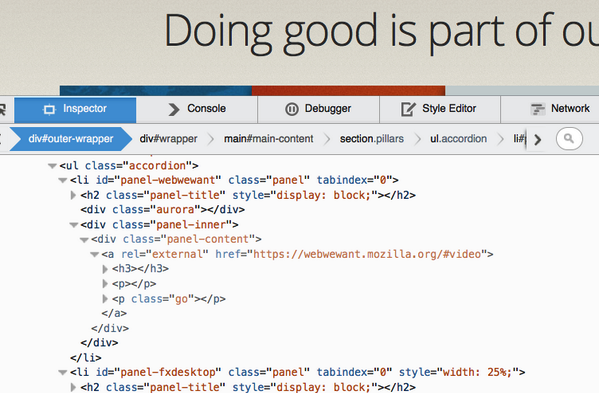 Firefox 32 was just uplifted to the Aurora release channel, so let’s take a look at the most important Developer Tools changes in this release. First, we would like to thank all 41 people who contributed patches to DevTools this release! Here is a list of all DevTools bugs resolved for Firefox 32. We’ll start out the list with a couple of features that were requested on the new UserVoice feedback channel that we are trying out. 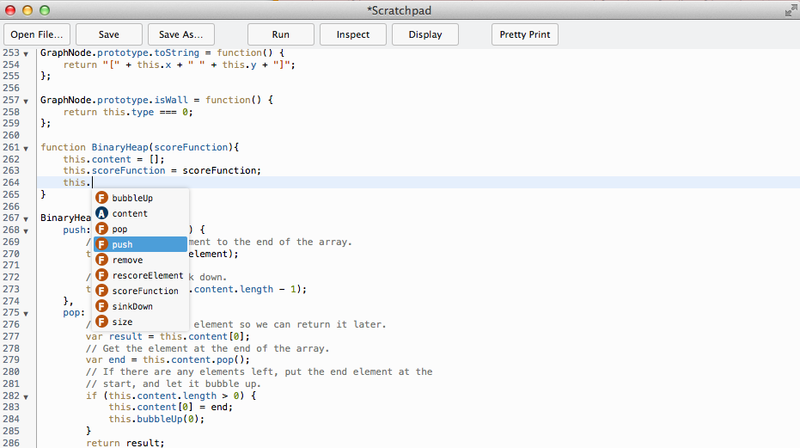 Joining the Shader Editor and Canvas Debugger, the Web Audio Editor is a new media tool that has landed in Firefox 32. After enabling it in the options panel, you can inspect the AudioContext graph and modify properties on AudioNodes. Check out the Introducing the Web Audio Editor hacks post for much more information about this tool. Do you have feedback, bug reports, feature requests, or questions? As always, you can comment here, add/vote for ideas on UserVoice or get in touch with the team at @FirefoxDevTools on Twitter. You should be able to see these styles in the Inspector now if you enable user agent styles. That bug report has to do with the Style Editor, which still doesn’t show user agent / addon injected CSS. I’ll comment on the bug with some steps for doing that. I won’t have to repeat for the 94340984th time to my girlfriend “shift-f2-screenshot-name-of-your-file-dash-dash-fullpage” anymore, thanks! I tried to switch from chrome to firefox as my daily driver a month ago; however without the node dimensions it was impossible. If you could just implement adding styles on the fly to a highlighted node, I would make the switch. I think you are referring to adding new selectors in the css rule view – luckily this bug is assigned and being worked on :) https://bugzilla.mozilla.org/show_bug.cgi?id=966896. You could also always flip over to the Style Editor to do this, but it will obviously be handy to do this right inline in the inspector. Just click between and add styles. You can also add any number of new css rules, from the style editor tab. Any chance of providing a tool to inspect the context of a Knockout ViewModel? It’s the one thing I switch to Chrome for, but I much prefer the Firefox browser/suite of dev tools. I don’t know of any extensions doing that yet, but I know that the Ember Inspector project had success in converting a Chrome DevTools addon into a cross browser addon that targets Firefox DevTools as well: https://hacks.mozilla.org/2013/12/ember-inspector-on-a-firefox-near-you-2/. We have also been working on some addon SDKs to make this type of thing easier. So I think there is hope you will see this, but someone will have to build (or port) an extension. Similar, when we type something like ‘border’, it’s showed options from ‘border’ until ‘border-images’ (Not all properties are showed… It would be better a scrollbar with all properties ‘available’)…. Thanks for the feedback! As mentioned in the post, please add your feedback at the feedback channel at UserVoice. Oh come on! The developer tools are useless if you can not add custom style rules. Just pseudo selectors are absolutely necessary! In Chrome it all has long been implemented. You can already add custom rules in the Style Editor, but support for this in the Inspector is being worked on here: https://bugzilla.mozilla.org/show_bug.cgi?id=966895.